Yesterday I did a new set for Rachael who I've not seen in a few months as she was saving up. I'm sure she will agree that our appointments are typically a hoot and this was no exception. Whenever I ask her what she wants on her nails she always says red but it's rarely the colour she walks out wearing. I showed her a couple of colour ideas as she has very similar taste to me so it's easy for me to grab a load of colour pops and glitters and this is what she chose over her enhancements. I used CND Shellac in Wisteria Haze and Blackpool along with a Yours by Sascha Gossen plate and Lecenté Fireworks Glitter in Mortar. 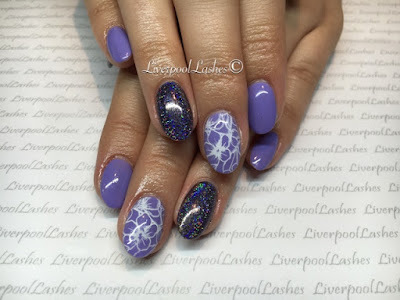 Rachael has Wisteria Haze on all nails apart from her ring finger and thumb which has Black Pool on it. 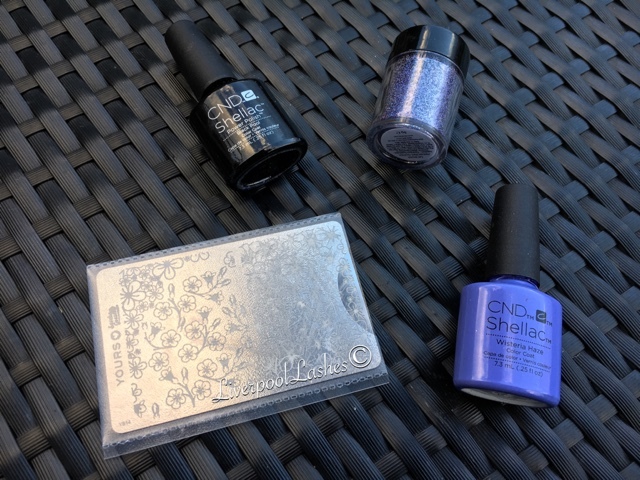 I applied Mortar glitter over Black Pool which I adore and stamped a white print using the Sascha Gossen stamping plate. Don't forget I'm on Instagram, Twitter and Snapchat - search for liverpoollashes and keep up to date by following my Facebook page.